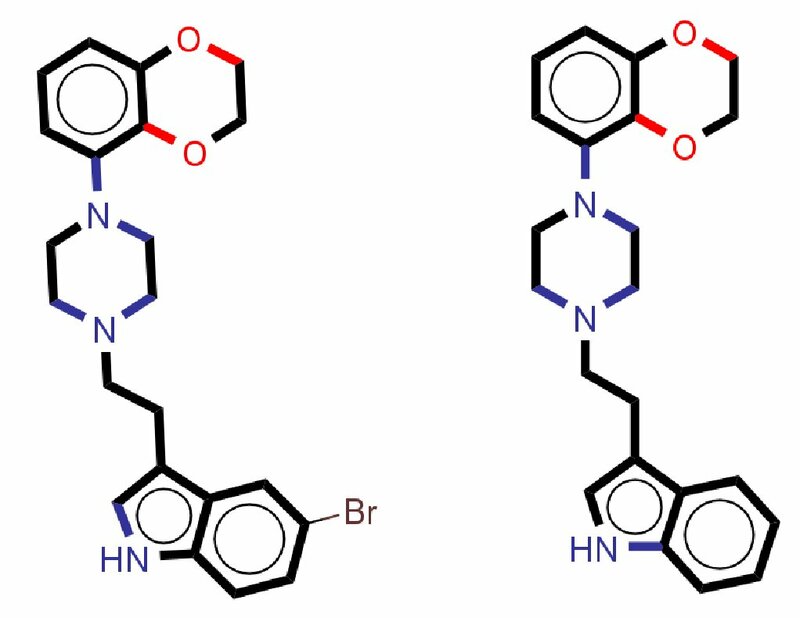 In the final year of my PhD, I have been investigating different forms of alignment of chemicals, and seeing which method is best at predicting whether a chemical will be active against a particular drugtarget. Similarity is subjective to a particular problem domain. As an example, which two most objects are most similar – an apple, a pumpkin or a basketball? All three are more or less spherical, but the pumpkin and apple have the similarity of being fruit, while the pumpkin and basketball are a similar size. The same subjectivity exists in chemistry. 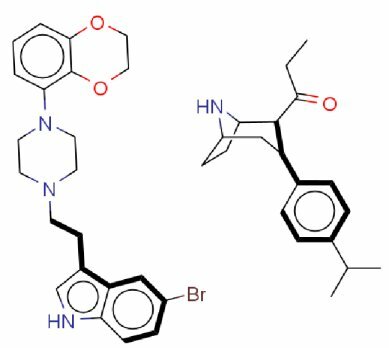 A common goal when searching for similarity in chemicals is to predict whether one compound will act in the same way as another compound, known to have useful pharmaceutical properties. The desired “similarity” in this case, is a similarity of biological activity: something which, at present, is impossible to predict. However, we can attempt to infer such a property from aspects of structural similarity. Serotonin reuptake inhibitors is a group of chemicals that includes many useful antidepressants. Consider the examples below, of compounds that act as serotonin reuptake inhibitors. In the first case (Figure 1), similarity is based on the largest common fragment (highlighted in bold). The similarity here is obvious, the only difference being the Br atom. 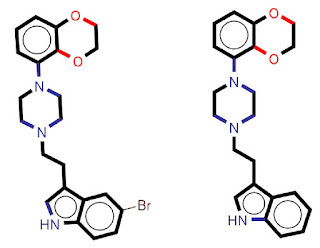 However, the same technique fails to show the biological similarity between the two inhibitors in Figure 2. 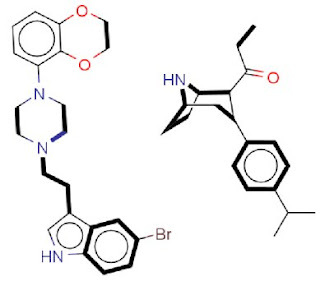 In this case, the approach of finding the largest fragment has failed to highlight the “similarity” between the two compounds. A technique based on finding the maximum possible overlap of edges however, is more successful (Figure 3). This method, which seeks to find a set of common fragments emphasises a different “similarity” between these compounds. Many thanks to Sheila Webber for her entry on this blog regarding the recent Times Higher Article (THE) on peer review. The article is well worth reading and makes several valid points. However, a distinction should be made between peer review and anonymous peer review. Peer review (both formally and informally) is a widespread practice in many professions (including academia). Anonymous peer review used to be the preserve of academics, but (thanks to Web 2.0) is now a feature of 21st century life. Anyone who has selected a restaurant on TripAdvisor is likely to be reading an anonymous review by a peer from the dining community. One key difference is that a bad review on TripAdvisor can be countered by the business owner, and is not likely (on its own) to bring down the business. The nascent careers of academics are more fragile. Another key difference is that, on TripAdvisor, I can visit the restaurant and read the reviews, then assess how representative the review is of my interests and my tastes. In other words, how much of a peer was the reviewer? When academic peer review began, it was not anonymous. At some time after WWII, arrangements by which journal editors informally contacted academics for advice on submitted articles appear to have been formalised in the system of anonymous peer review. Prior to that, the interests, characters and prejudices of reviewers would have been known, resulting in greater openness and (occasionally) unrestrained unpleasantness. However, the reviewer's credentials could be assessed and (if necessary) questioned. One contributor to the THE article notes that, in his discipline alone (economics), there are 20,000 new journal articles every year. The pool of reviewers must therefore be very large, prompting the question: to what extent is a reviewer a peer of the author? The THE article ends with a contribution from an anonymous author who is is establishing a website for particularly bad examples of anonymous peer review. I would certainly applaud such an exercise but I hope that, as well as giving the opportunity to read the poor reviews, the site also publishes the articles that attracted them. It will be interesting to see how many suffer from poor writing, poor research and poor analysis, and how many suffer from being unorthodox and innovative.